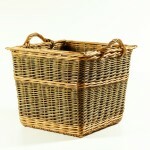 We use the finest British willow to make our chunky hard-wearing wicker log baskets that will last for years. 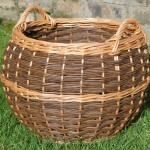 We mostly make log baskets to order, but do try to keep a few in stock, especially around Autumn Winter time. 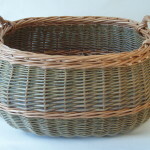 With a choice of natural willow colours, shape, size and weave the choice is limitless. 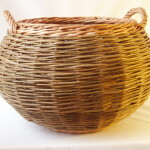 It’s worth a browse through our gallery page to see some of the bespoke log baskets we’ve made. 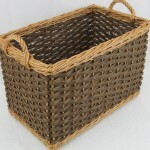 We can make the basket to fit under a bench, in an alcove, or to fit a limited space on the hearth. 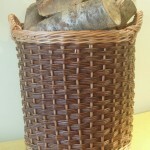 You can have a log basket that is not only beautiful and durable but has been designed and made just for you. Always happy to quote. Please just ask. 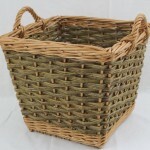 For our friendly, professional advice and to discuss your new log basket, email or call Alison on 01294 829012. 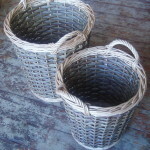 Our willow is grown on the Somerset Levels, a wetland area in the south west of England, where generations of willow growers have kept British basketmakers supplied with quality willow. It’s a fast growing crop and one plant produces stems for several years before needing to be replaced, so it is a sustainable crop. Some farmers bring sheep into the fields to eat the grass and weeds that grow between the plants. Cutting and planting out of of willow occurs between November and March – if you’re interested in growing a living willow structure, visit the RHS information page which has all the information you’ll need. It’s a lovely material to work with: flexible, smooth to touch and has a distinctive aroma when wet. Mostly the willow we buy has been dried so we need to soak it before using. In the winter time we can buy freshly cut willow (traditionally known as green willow) which doesn’t require any soaking.